The company is called Emrgy, and its mission is to tap the long-overlooked potential of producing electricity from canals and other man-made hydrologic structures. The Atlanta, Georgia-based, woman-owned startup has developed a compact, modular approach to "deliver a complete 'water-to-wire' system capable of harvesting the excess energy in water flows." Today, across the United States, the power flowing from utility, industrial and agricultural canals across the country is simply being lost. With Emrgy's technology, says Emily Morris, the company's chief executive officer, its customers will be able to "utilize predictable energy production locally that can be used for critical functions" -- as backup power, for instance, or to power pumps -- and/or to interconnect with the grid. "Emrgy provides a sustainable way to tap into slow or shallow waterways as a renewable source of electric power," Morris says. "Unlike other alternatives, like solar or wind turbines, which only operate when the sun shines or the wind blows, our turbine and drive train-based technology is designed to operate 24 hours a day, seven days a week." People are beginning to take notice. Last June, Denver Water installed the first of 10 Emrgy hydropower turbines along the South Boulder Canal in Golden, Colorado. Each turbine has the potential to generate about 80 MWh a year -- roughly enough to power for seven homes. In addition to Denver water, the project is being tracked by the National Renewable Energy Laboratory, the U.S. Bureau of Reclamation and the Colorado School of Mines. So far, the data on water flow rates and energy generation has been everything Morris and her team could have asked for. Since founding Emrgy, the company has secured over $3.5 million in funding, and it is the first business ever to receive an equity investment from Atlanta's Development Authority and to be inducted into the city of Atlanta's Innovation Center. Recently, Renewable Energy Magazine caught up with Morris to discuss her business and the future of renewable energy in the US. Today you are in Denver at the NREL growth forum. Tell me a little about the event and what you're doing there? Well, this is an annual event here in Denver. And it has been fun. I think this is something like the 30th annual NREL Industry Growth Forum and it's a bit different, in that I think most of events held under the auspices of the nation's national labs are typically quite technical or academic in nature. This event, by comparison, is really more industry-oriented. They bring in a lot of innovative startups, and then they bring in a number of people from their renewable energy investment community, and 30 to 40 startups are selected to present or pitch to the investors. In addition to the presentations, the forum also provides opportunities for one-on-one meetings with potential investors. And then, toward the end of the week, they hold an award ceremony -- a kind of People's Choice Award -- where the judges acknowledge particularly well-done pitches. So, it's an opportunity for networking between start-ups and renewable and clean tech investors. I presented on Wednesday. I did a short pitch about Emrgy, and since then I've been meeting with potential investors. I'm heading back to Atlanta today. That's interesting because I perceive of you, at least from the bio on the Emrgy website, as coming to this from the world of finance. I would say I am definitely not on the technical side, in terms of my background. I can take part just enough to be dangerous. I have been working in engineering-inclined positions my whole career, so I've been surrounded by engineers, but once I get too deep into the details, I've got to take a step back because it's not really my expertise. That said, my background is not so much from the finance world as it is the contracting world. I did a lot of government contracting and a lot of federally-sponsored research programs throughout my career, and actually built Emrgy's initial technology with funding from the Office of Naval Research, with the military focus, and then continued research under the auspices of the Department of Energy. We were awarded $1.2 million from DOE's Energy Efficiency and Renewable Energy office back in late 2015 to pursue the technology as Emrgy, and that enabled me to move over full time and start building a team. So that's sort of the world I come from -- seeking sponsorship, whether it's federal and public sponsorship or private investment into technologies and new ideas. As you're saying this, two questions come to mind. The first is, how unique is the environment you're in at the forum, in terms of soliciting funding? Is this a different kind of solicitation setting compared to what you're used to? Secondly, considering your audience, what was it that you felt most needed to be communicated about your company and what it's doing? It is a little bit different because you have a much bigger audience than you typically have on a day-to-day financing request, where you might be in an office with five to 10 people as opposed to a couple hundred. So it is different from that perspective, and I think there are a couple of important things: One, to make the story of Emrgy and the vision of Emrgy as simple as possible for people to understand. Renewable energy technologies can often be quite complex to explain and I think that really kind of hurts the industry -- and certainly startups within the industry -- because what investors want to see is what can be done with their money. They're not necessarily interested in the intricacies of the given technology or what kind of cool innovation you may have come up with. The second thing is getting them to see that Emrgy represents something new in the hydro-kinetic space. The sector we participate in is one that's been talked about for a very long time, study after study has detailed the amount of power available in our canals and rivers and other kinetic fluid environments. There have also been a number of concepts introduced over the years that have been very interesting. But there is no incumbent company that has market share in hydro-kinetic. You don't see these types of tidal turbines or these drives as you travel around say, Charleston, South Carolina, where you are located. And I think because of that, there's a little bit of apprehension around the subject. People genuinely wonder, is hydro-kinetic power real? Or is it something that could be real in a different world? So it's super important for me to document the true progress and the traction that we've made in deploying the first hydro-kinetic array in the United States. Yes, in Denver, Colorado. We partnered with the city of Denver, Denver Water and the U.S. Bureau of Reclamation in the past year. And so, when I'm able to show pictures and videos of the machines actually in operation and producing power, that's an enormous plus for us. I'm able to highlight to people that this is real and that we're actually doing it. Of course, we're still in an environment where if you mention renewables, most people instantly think of wind and solar and the technologies associated with those sectors. Were you the only person at the forum pitching hydro or hydro-kinetic this week? We've touched on this a little bit already, but with the Denver project specifically in mind, what do potential investors really want to know about something like this? Most people do not need to know how it works. In most cases, presenting them with a short video or an explainer sheet will suffice, because most people have seen turbines in some other capacity or can imagine how a rotary motion becomes electricity. That being the case, I'd say most of the questions we get revolve around, "Can you actually build the product?" and "Can you build it at a cost that allows me to make money?" Potential investors will also go a step further and ask, "How can this technology be delivered effectively to the site" And "How do they behave out in the field, from a maintenance perspective?" And from there, it can get down to, "How do you make sure that maintenance can be done properly when water is running through a canal?" But the biggest question, so much so that it's probably the elephant is the room is, "how do you scale this up?" You know, pulling energy out of water and converting it into electricity is something that's been done for centuries. So what they want to know is, how do you scale a technology that could be dozens, hundreds or even thousands of machines stretched along a specific distance of canal? Do you place one of these units in a canal or two? And if you put more than one in, will it cause the canal to overflow and impede the canal's operation? The water bodies we're focusing on were not built for power, they were built for moving water from one site to another, either for drinking, or water treatment or for irrigation purposes. So in retrofitting the canal, you have to make sure that in doing that, in creating meaningful, cost-effective power generation, you're doing it in a way that does not diminish the integrity of the original operation carried out by the canal. That's why this has been an untapped market. In the past, companies have tried to scale down traditional hydropower technologies and the result has been placing dams on canals and things like that. Also, our customers don't want to dam their canal because they have to move the water from place to the next so that farmers and citizens are assured of having access to the water they need. So we get a lot of questions around that because of course both customers and investors want to know, how many of these we can place into a canal, how much power can be reliably generated, and ultimately, how profitable the project will become. 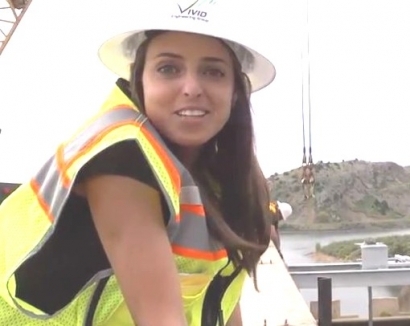 The Bureau of Reclamation has committed three years of engineering time to the project in Denver. They have hydraulic engineers staffing the project. They fully implemented the project with water level sensors as well as velocity and current profile sensors to be able to independently answer some of those questions of how the system integrates with canals. The project in Denver is a 10 module, 100 kilowatt array of hydro power ... it requires or consumes about a thousand feet of a nine mile-long canal. And we are performing lots and lots of testing and collaboration with Denver Water and the U.S. Bureau of Reclamation and we'll be grid connecting the system with United Power late this summer. It's very exciting. How did an Atlanta-based company get involved with a project in Denver? It's funny, actually. I had developed a presentation for a regional meeting of water managers that was held in California about three years ago, and basically my intention was just to introduce Emrgy to potential customers. And after my presentation representatives of Denver Water came up to me and said our concept was something they'd been looking for, for a very long time. They are very forward looking and very serious about their sustainability goals. They are very intent on deploying renewable energy throughout their system, and that already operated seven other hydropower facilities within their network of water conveyance and water treatment. So the fact we were offering a solution that they had been looking for was a natural fit. Oover the course of the next year, we worked on getting all of the approvals and getting everyone on board. And we spent the following year really planning and looking at various sites. We did a good bit of site selection work. And then, two years to the day after meeting them, their board approved the purchase of 10 of our 10 KW turbines. So it has been a really amazing partnership and an incredible opportunity for Emrgy to be able to demonstrate our product and be able to test out many of these questions that had never been investigated before relative to how arrays can be scaled because no one's ever done that before, here in the US at least. It has been a great opportunity to do that and it has been a launch point for us to encourage potential customers and potential investors. We've had interested customers from Arizona and California fly to Denver to see our site and investigate whether that might be a worthwhile investment for them as well. And you know, I think the story of Denver is one that, while it might be unique for some startups building products, it is not unique to our sales process at all. You wouldn't believe how often I meet with a new irrigation district or a new water management districts that says, "Hey, we've been thinking about this type of energy or this type of solution for a very long time, and if you can provide that to us it’s something we're definitely interested in." There is a need for education around why this is important to many of our customers. As I've been listening to you, I've been thinking about potential customers and my thoughts are drawn to places like South Florida, where water resources are heavily managed and there are many, many canals. But I know first-hand that a single significant canal can have many stakeholders. Have you come up with a strategy to address potential stakeholder complications and get as many people as possible on board for one of these projects? One thing we have been intent about is staying within man-made waterways -- structures created for a specific purpose or set of purposes. While these might have multiple stakeholders, it's often a very clear set of stakeholders, especially when compared to a river or other natural areas, where you might have recreational and navigational uses. We really try to stay very narrowly focused on canals that are for water delivery either to farmlands or to residential areas. And in those cases, it is usually pretty clear what powers oversee that body of water. In the case of canals, they are typically governed by a board of some sort, and we can make a presentation directly to them. And while, as in the case of Denver, many of these entities have very serious sustainability goals, often, just like buying any other product or piece of equipment, it comes down to the economic and commercial investment. So if we can show these entities that this is an untapped energy resource that they have, that they can monetize this infrastructure in a new way or they can receive benefits of saving on their electricity bills or being able to have the power output in their current portfolio, then often at the end of the day, it's an economic decision for many of these entities. What's next for you besides, of course, heading home to Atlanta? We are transitioning into true Beta customer relationship beyond Denver. We expect to have installations in both Arizona and California over the next year, and we are investing in our supply chain to be able to reduce the manufacturing cost and complexity and really grow our ability to deliver products quickly and cost-effectively. We believe the value of Emrgy and overall the hydro-kinetic industry will be most affected over the next two years by how many new customers and new installations can be brought online. I think now is the time to prove that hydro-kinetic is not just a novelty or not just something to talk about or study, but something to actually build and see benefit from. And so that's our goal and our mission over the next few years. We want to create a situation where you can reference or go be a hydro-kinetic installation without having to use your imagination.